FontShop and Bohemian Coding are happy to announce FontCase 1.5, a free update to the award-winning font management app for Mac OS X.5+. FontCase users can download the update from their FontCase app menu. Haven’t yet tried FontCase? Download the 15-day free trial now! If you open a document which specifies fonts that are not active, FontCase will jump into action and auto-activate those fonts. You can see which of your fonts have been auto-activated in a new sidebar filter. 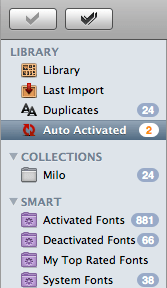 When you close FontCase, any fonts that had been auto-activated will be deactivated. FontCase 1.5 shows a marked improvement in launch time and overall responsiveness over previous versions. Preview caching is also now performed more efficiently, saving disk space. When FontCase launches, it will check if new fonts have been installed using other font managers. If so, it will import them into your FontCase library. Check out the FontCase page for more features and to download your free trial!